I’ve been flirting with and have been mostly vegan for a while. 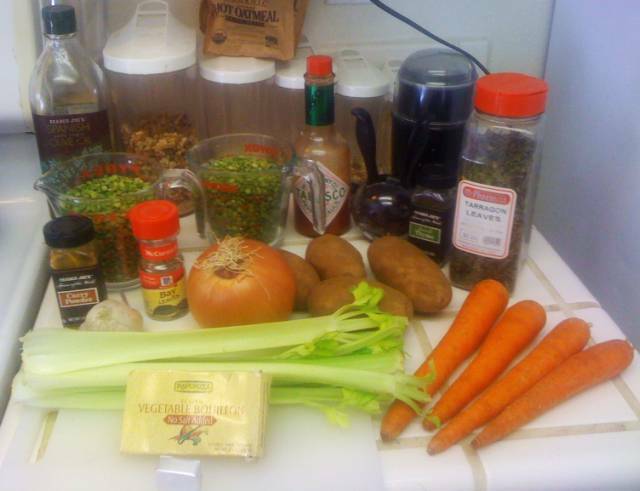 However, this blog post marks my commitment to going vegan full-time. I am happy about this decision and hope to share lots of yummy vegan foodie stuff with you all. I promise to break out my real camera instead of using the lower quality iPhone camera soon. 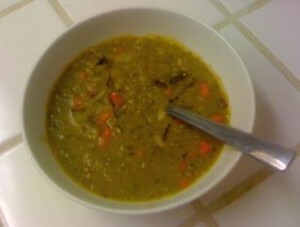 So, I was hungry for some hearty soup and looked around the kitchen and it turned out I had everything needed to make Funky Vegan Split Pea Soup. Usually it seems like I have to run to the store for one or two items, but I got lucky. It is one of my personal favorites and it pleases my lady (always a plus). It is also very economical to make, but does take some time. I add a wee-bit of curry powder and some chipotle peppers in adobo sauce to give it that little extra something something! Sounds exciting, hunh? 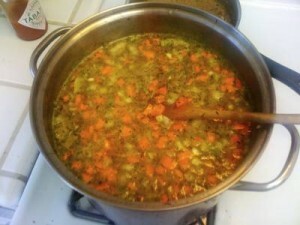 It takes a lot of frequent stirring and tender love, but it is well worth the flavor. It’s even better the next day. It can be served as an appetizer or a main course. Serves 10-20. Let’s get going. 1. 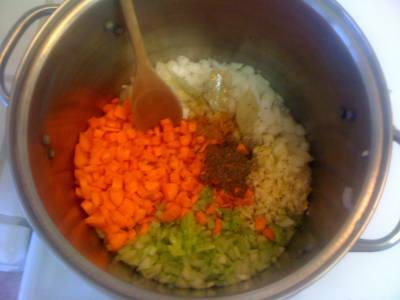 In a 6 quart stock pot, add garlic, onion, celery, carrots, extra virgin olive oil, curry powder, thyme, bay leaves, vegetable bouillon, and Cavender’s Greek seasoning. Sauté over high heat 4 minutes. 2. Add peas, water, potatoes, cumin, tarragon, and 1/2 each of the salt, pepper, and Tabasco sauce. Stir well. Cover and bring to a boil. Once boiling, remove lid and reduce heat slightly and continue to let boil for 20 minutes, stirring frequently. 3. 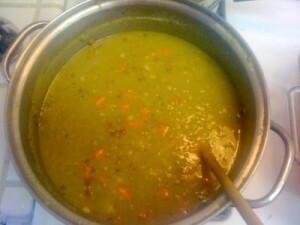 Reduce heat to slightly higher than medium and continue to simmer, stirring frequently, until peas break down and fall apart; approximately 40-50 minutes. 4. Remove from heat. 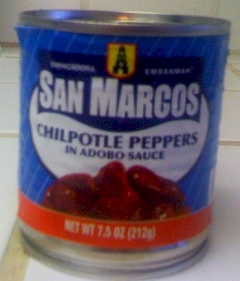 Add chipotle peppers. Stir well and taste. Add remaining salt, pepper, and Tabasco sauce to taste. 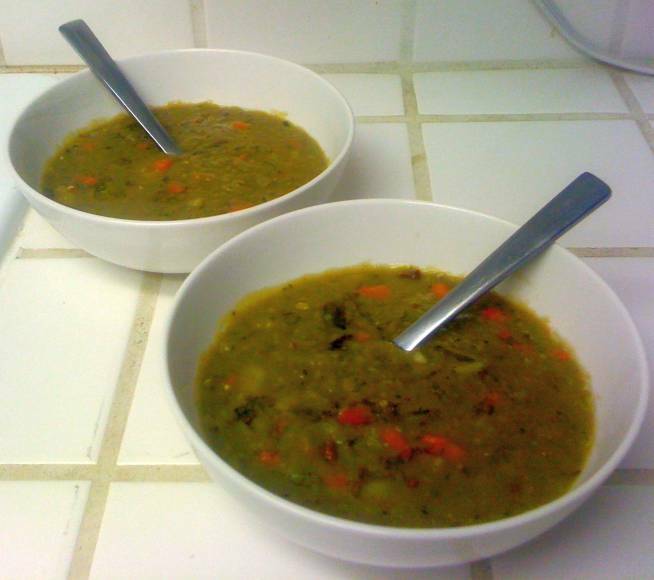 Let soup cool for 15-20 minutes before serving. Serve with a drizzle of extra virgin olive oil over the soup and French or sourdough bread on the side.